When you travel, coordinating arrangements and keeping track of all your receipts, travel documents and miscellaneous information can be overwhelming. My friend and I are planning a trip to England. Plane tickets and itineraries are not straightforward because she's coming from Orlando, I'm coming from Chicago and we're meeting in New York. As a SkyDrive subscriber, I could create my notebook, upload it to SkyDrive and send my friend the link. The OneNote Web App would let her upload information, too. The best part is that I have access to that notebook on my Android phone with the OneNote Android App. I'm also now using OneNote to manage my work travel. I can have everything in one spot and share it with my family, the event hosts and my staff. And on the road, I can snap photos of receipts, cab numbers, hotel room numbers, anything snap-worthy, and upload it on the spot. Here’s how to set it up. After launching OneNote, create sections at the top. 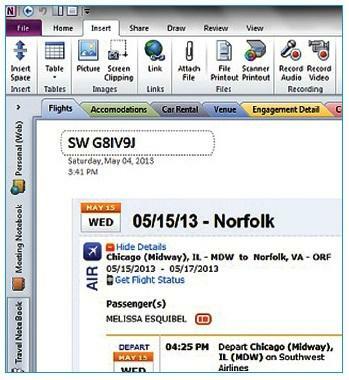 I created the following tabs: Flights, Accommodations, Car Rental, Venue, Engagement Detail, Contacts and Expenses. Click the * tab to open a new one. After saving this as my “template,” I decided on a few rules to live by in this notebook. No. 1: Name the first page of Flights the airline and confirmation number. On the Android App, just tapping the Flights section lists the names of all the pages and my confirmation number. This is also a great place to paste the link (or printout) of your boarding pass after you check in. Name that subpage the flight number and gate if you know it. No. 2: Name the first page of Accommodations the name and address of the hotel. This is great to have in your hands when jumping into a cab. No. 3: Label the first page of the Car Rental section the name of the car rental company and the rental company’s confirmation number. I added a table to record expenses with a plan to add a page for each re­­­ceipt I snap. It’s easy to copy the table to Excel and use the data for my invoice. I can also add any special forms needed to file my expenses later. I sent screen clippings and printouts directly to OneNote. OneNote appears as one of my printers. I then saved my notebook with a name that showed the city and the date. You can also easily add email messages right from Outlook, attach files or insert hyperlinks. I can put a link to slides and handouts stored in SkyDrive. Since I already have a SkyDrive account, I just clicked File, then Share to upload it and send a link to interested parties. Even if those people don’t have a Microsoft account, they can use the OneNote Web App to view and edit (if I allow that) the notebook.